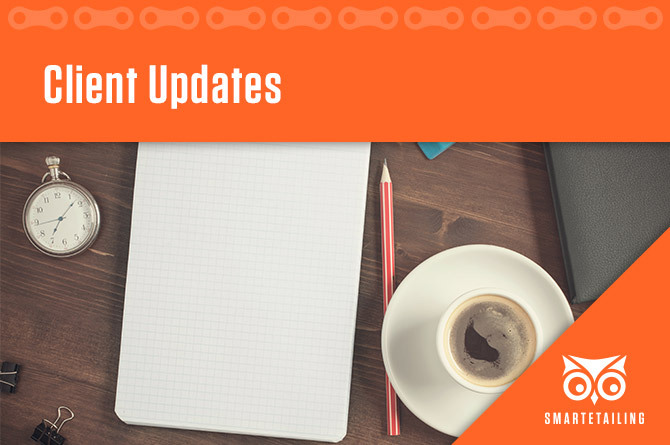 Read the latest updates from all the teams and departments at SmartEtailing. Each month our team is working tirelessly to get your website and tools working as efficiently for you as possible. In order to further improve data security have updated permissions for retailer FTP accounts to “write only” access. This change prevents third parties from accessing your point of sale data using your credentials. There is no change to how your SmartEtailing Point of Sale Sync operates and your website functionality will not be impacted. We have no record of third party vendors who have access to individual retailer FTP credentials so regrettably are unable to personally notify businesses that are impacted by this security update. If this change impacts you, please contact your point of sale provider to implement an updated data sharing solution with third party vendors. To find images for your responsive website pages, login into website and go to Content Manager > Home Page Highlights > Highlight Library. Open the folders and look for the sub-folders titled "For Responsive Templates" to find background images and even text-based graphics you can add to your responsive content blocks. When you find the image you want to add to your site, you can save to your computer, or simply right click and copy image URL (it may say Copy image address, or Copy Image Location), depending on the browser. Go to your responsive page and paste in the image URL where noted for your content block. A program we like – Clip-X (free, easy to use) allows you to copy more than one thing and then paste, so makes page creation easier when you can gather several image URLs and then select and paste into your page. Keeping your online catalog dialed in helps in-store sales, too. For potential customers, knowing that you have the bike they want can make all the difference. We've talked to more than a few retailers who tell us about customers who have driven past other bike shops to get to theirs because the customer say they had the product they wanted. Follow our POS Sync Best Practices to keep your catalog dialed in. As the weather changes and you have more time to focus on your site, now's the time to review the older content on your site and update or delete it. Then use our Mixed Content Report to see pages that still matter but that may need attention. All SmartEtailing websites must be migrated to one of our mobile-friendly website templates by December 1st. With so many people viewing your website from their phone, it's more important than ever to be on a template that looks great no matter what device your customers use. Many of the updates we've made to the SmartEtailing platform are only available on a responsive template. Don't get left behind! We offer supported migration options, starting at just $500. Any template that is not mobile friendly will be unavailable at the end of this year. Click here to learn more & get started. Stay current with newly available and upcoming brands on the home page Update Center in the back end of your SmartEtailing website. A custom website is like a well designed store location. We plan, design, and build each element of the website to match your brand identity, to welcome your visitors upon entry, to excite and inspire them with engaging content, and to make it easy for them to find the product or service that they need. Read our recent blog post about custom design or visit or custom website gallery. New homepage highlights and landing pages are always in the works. Recently, we've added the following new content to the marketing Library. Need help installing new content? Reach out to our support team for assistance.